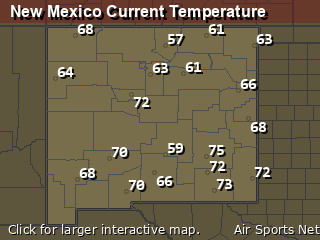 Change location by the zip code or city,state: or search for other weather forecast locations in New Mexico by name. Today... Mostly sunny, with a high near 79. Southwest wind 5 to 15 mph. Tonight... Mostly clear, with a low around 47. West wind 5 to 15 mph becoming east after midnight. Monday... Mostly sunny, with a high near 72. 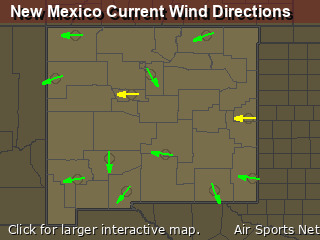 Northeast wind 5 to 10 mph becoming southeast 15 to 20 mph in the afternoon. Monday Night... Isolated showers and thunderstorms. Mostly cloudy, with a low around 43. Windy, with an east wind 20 to 30 mph, with gusts as high as 40 mph. Chance of precipitation is 20%. Tuesday... A 30 percent chance of showers and thunderstorms. Partly sunny, with a high near 66. Breezy, with an east wind 20 to 25 mph decreasing to 15 to 20 mph in the afternoon. Winds could gust as high as 35 mph. Tuesday Night... A 30 percent chance of showers and thunderstorms before midnight. Mostly cloudy, with a low around 42. Wednesday... Mostly sunny, with a high near 74. Thursday... Sunny, with a high near 81. Friday... Mostly sunny, with a high near 83. Friday Night... Mostly cloudy, with a low around 54. Saturday... Mostly sunny, with a high near 84.